I am in like Flin; life is good in Kpalime, a change of homes, a change of Hotels, and a different channel. I found a great hotel for 5000 CFA or about 10 US, about the bottom of the deck is 3000. I took a tour of all the hotels, think I stopped at most in the guidebook, and one not in the guidebook. Thanks to the NGO - ONG for make the best hotel, the least favorite. NGO drive cars, go away from the city, from the people are more or less living the exclusive lives, therefore the nicer hotels are outside the middle cultural parts of cities. The price of hotels is funny here; I had to tell the nice manager, Sarah. She finally dropped to five Mille, I do think the prices are all negotiable, everywhere, just a matter or wanting to try. The have a room here for about four, could maybe get for three, the problem is, maybe there is noise or boom in the night, and I am not sure. Boom Boom hotel is better than a Buvette Bar Hotel, as less noisy in a way. All are Boom Boom, yet this hotel is more local, not NGO or ONG Boom Boom. The guidebook calls the room Spartan; I think it is white and bright, no place for the ants to hide. 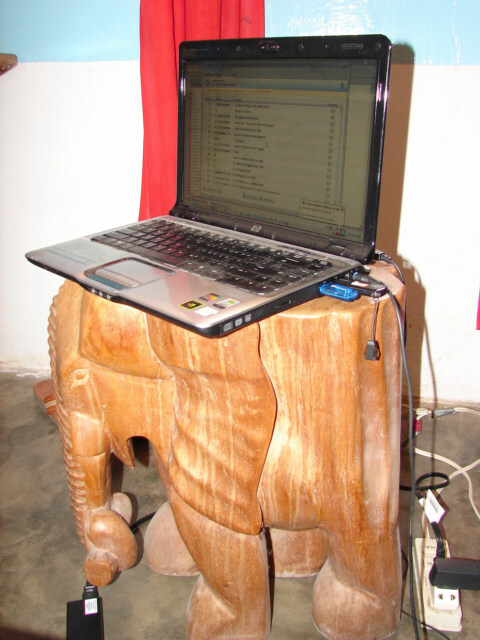 I got an Elephant for a nightstand computer table; my cell phone signal is better here close to the Market and the cultural center of Kpalime, and not near the Toyota Land Rover parking Hotels. Because the Cell Phone signal with Togocel is good, I have a good GPRS internet connection and can blog away easily. Hello, Church Bells! Not a bad sound, soft and light, I wander, it is noon, maybe a Monday wake up.